In my everyday life and work developing GQueues I often find myself chatting with someone and then need to share an image to reference in our conversation. Since Google Chat doesn't support sharing images, this usually involves sending them an email with the file attached, telling them it's sent, having them wait for the email, open the attachment and then we can continue on. Does this ever happen to you? If so, you know what an annoyance it is and waste of time. In my quest to become more productive and simplify my life, a few months ago I decided it was time to end the pain. 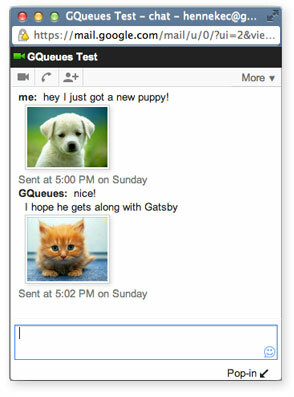 After a weekend of coding I finished GChat Pix: a Chrome extension which automatically uploads and shares an image just by dragging a file from your desktop to the chat window. If the other person has the extension too, they will see a clickable thumbnail directly in the chat window; otherwise a link is displayed. I've decided to share this with everyone for FREE, so if you use Chrome and want to chat with images get the extension from the Chrome Web Store and give it a shot. Watch the video below to see it in action. Note: since the extension is free, the maximum file size right now is 1mb and images are only available for 24 hours - the extension is intended for ephemeral sharing, not long-term file storage. Chrome users, remember you can also get GQueues and the GQueues Chrome Extension so you can access the app from the new tab page and create tasks from any website. We are paying subscribers with 2 accounts. I cannot find a single way to contact you guys email/phone/twitter whatever... it's frustrating. This extension works great...used it a few times yesterday! i downloaded the extention but i still cant add/drop..
you're the man.. thanks for doing this!